This is a crazy week for us around here. My husband is having back surgery in a couple of weeks, and we have all sorts of things that need to be done before the surgery and we have several appointments scheduled for this week, so I have very little crafting time this week. I am hoping to get in some solid crafting time on Saturday for World Cardmaking Day! I wanted to share this card that I made for a friend. The cardbase is Papertrey Ink Ripe Avocado, the accent strip is Aqua Mist and was impressed with the Papertrey Ink Picnic Plaid Impression Plaid. The frame was cut from My Mind's Eye glitter paper in the eCraft using Fundamentals 1 SD Design Card. This frame normally has draw lines on it, but I just removed the pen before cutting to get this look. The flower is cut using Spellbinders Nestabilities Peony dies and I cut them out of Papertrey Ink Simply Chartreuse and Dark Chocolate felt. I topped them off with a Papertrey Ink Rustic Wood and Harvest Gold buttons tied with Rustic Jute twine. The sentiment is from the Paper Tray stamp set also from PTI. Thanks for stopping by today, and I will have more Disney sweatshirts to share soon! Well I missed the August Blog Hop, but I wasn't about to miss this month's! The challenge for this month was to demonstrate a technique that you have learned from other stampers. When I first started stamping, I didn't do any layering of stamps. From various stampers suggestions, I started to experiment with layering my stamps. Here is a card that I quickly prepared this morning before the kids got up that shows this! I used two different background strips from PTI's Polka Dot Basics II, the smaller stamped in Dark Chocolate ink and the larger dots in Terracotta Tile on Harvest Gold cardstock. I added a 2" strip of Harvest Gold to the middle of the card. 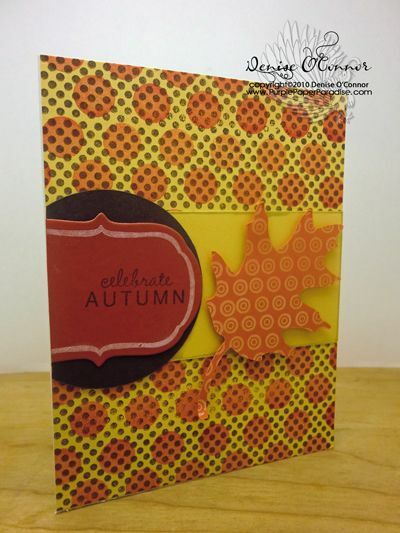 I used my eCraft to cut out the leaf in Orange Zest (stamped in Background Basics: Retro using Fresh Snow) and the circle in Dark Chocolate cardstock. Both shapes are from the Fundamentals 1 SD Design Card. I also used Fillable Frames #8 die to cut out a piece of Terracotta Tile cardstock, and stamped the Fillable Frames #8 frame in Fresh Snow. The sentiment is from Fillable Frames #7 and is stamped in Dark Chocolate. This overlapping of background stamps also works great with Versamark ink as your 1st stamp layer with a colored stamp on top, it is a much more subtle approach to the same technique. Thanks for stopping by and I can't wait to see what everyone else comes up with! Ok, so I haven't posted anything in awhile, but that does not mean that I haven't been working on it! I am currently working on cutting some felt with the eCraft, and fortunately Gabriella at Craftwell is helping me out with it. Hopefully I will have something to report next week for you. I am getting there, so we are on track! The other thing that I am working on is a rather large project with my friend Desiree. After working a little bit with T-shirt (heat transfer) vinyl, we came up with this idea to make Disney sweatshirts for everyone in our families. Quite an undertaking especially considering how detailed the Disney cuts are. For most of the cuts, we are using the Disney cartridges from Cricut. We actually got one of them finished today, so I thought I would share a quick picture for you. 1 down 8 to go! 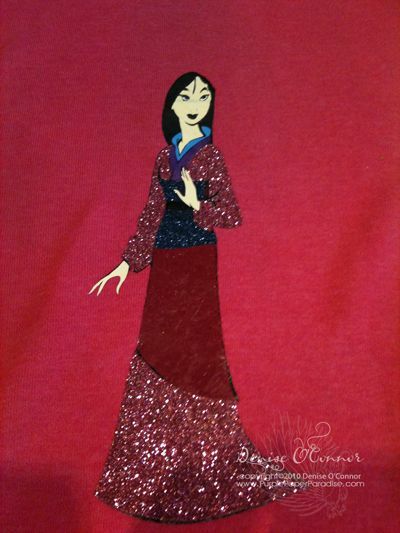 Here is Desiree's Mulan sweatshirt, and this picture does not give this justice at all! Most of the t-shirt vinyl used here is from www.craftvinyl.com including the pink and blue glitters. The skin is actually from the Siser Easyweed line and the color is called Cream. I got this from http://www.specialty-graphics.com/ and I think that Desiree and I actually prefer this product for only one reason. The Siser Easyweed is a hot or cold peel product and the others were all cold peel. It look a lot longer to put it all together because we had to wait in between colors to peel off the acrylic sheet to make sure that it adhered well. With the Siser, after we ironed it on, we instantly peeled it off. Instant gratification! These glitter vinyls are absolutely stunning, and this looks so great! The Mulan cut was from the Happily Ever After cartridge and I cut out all the pieces on my Cricut Expression. I will be posting pictures of all the other ones that we are making, and we are having so much fun putting these together! We were joking that we will end up not only any clothing that hasn't been "vinyled up". Actually that just may end up being true! Debbie on the eCraft Yahoo Group mentioned that she had trouble finding Tom Meeks' videos on the Create & Cut blog. He decided to put in some links to his videos, and it got me thinking...why don't I add his videos to my eCraft Videos Page. So I did. I will also add any other videos that I find, so check the page out often. On a personal note...I have not had a lot of crafting time the last few days. My husband is going to be having back surgery in a few weeks and we have several preparations to get ready for it. Since he is on some very strong pain medication, I have to drive him to all of his appointments, as well as take care of the house and our boys. As scary as it is for him to have a surgery like this, it is a blessing. He is in so much pain 24 hours a day, that even if the surgery doesn't completely eliminate his pain, any relief will be monumental. I do have some crafting time planned with my friend Desiree tomorrow as we undertake a rather large project. Hopefully we can make some good progress so that I can share some pictures. I will be making time to create some videos once we have the eCraftshop Pro software update...I am anxiously awaiting this update. I today tried to cut out an SVG really quick and ended up with the infamous random circles. Argh! I hope that Craftwell realizes how important it is to get this software functioning better, as the ability to cut SVG files was a big selling point for them. I would not have (and I know most other owners) bought the machine without this ability. I certainly hope that this is their top priority with this update! Awhile ago, I posted this picture of some glass etched address blocks that I created. HERE is the original post. At the time, I was unsure as to how I was going to light these. I wanted a small light so that you wouldn't see a huge bulb through the glass. One day, I was shopping at Meijer and found these. They are LED nightlights with a light sensor so that they will go on and off depending on the light. They are made by First Alert. So I bought some to experiment with. I was able to easily pop off the top with a butter knife. Unfortunately the diameter of this light is just a smidge too big to fit inside the hole of the glass blocks, but never fear. 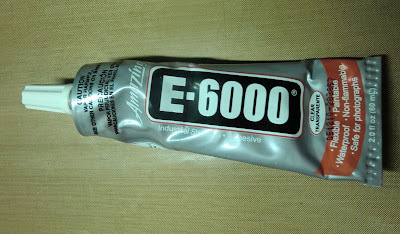 E-6000 to the rescue! 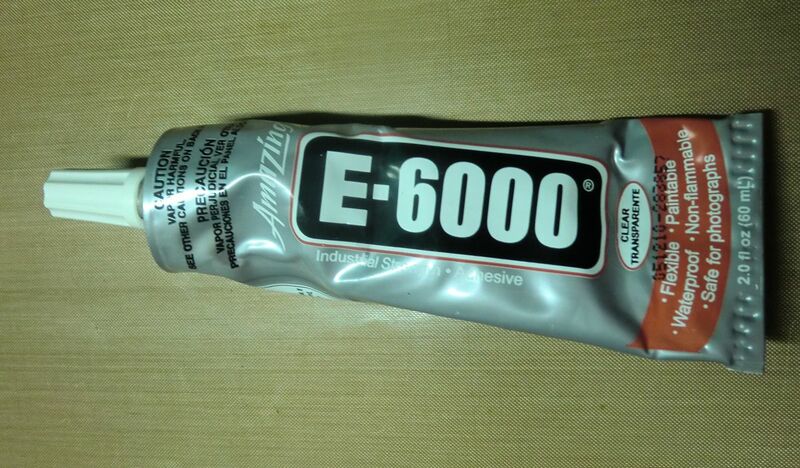 This stuff is great, I have fixed many things with this that other adhesives just would not work with. I placed the light on top of the hole, and applied a bead of E-6000 to the edge all the way around. 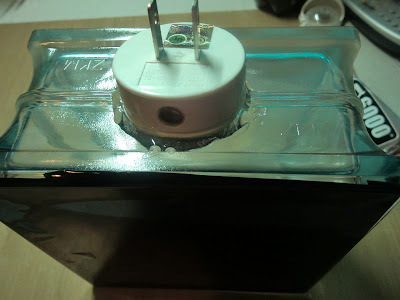 I made sure that the light sensor was in the back of the glass block. I let the E-6000 dry and it was securely fastened to the glass block. 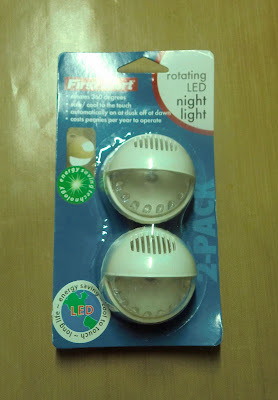 The next step was to figure out a way to get power to each of the three lights. I rummaged through the Christmas stuff and found an extension cord that is made to go up and down the Christmas tree. It has three outlets in three different spots on the cord, so I hooked them up. From there I just need to place the blocks in their stands and place them outside. Awhile ago, I posted about a vinyl wall art project that I was working on for my MIL. For part of it, I used alcohol inks to color some white vinyl. Well I finally got around to putting it up for her. I put this over the doorway to her living room in the foyer. This picture really does not do it justice, I had to stand on her stairs to get a good shot of it, and her lights were reflecting off of it. She was thrilled, and it looks so much better in person. I did learn one more thing about using the alcohol inks on the vinyl. Don't put your transfer tape on it until you are ready to put it up. I had cut the vinyl and put the transfer tape on it to protect it. When I went to install it, some of the ink came off with the transfer tape. It was not enough to cause me to want to re-cut those parts, but I think it would overall look even better if those parts were just a smidge darker. This entire project was created in Make the Cut on a small scale. I then enlarged it to where that flourish would fit on one 12x24 mat at a diagonal. I then broke apart all the words and fit them on the mats. I then had to assemble all the pieces as I was installing it. Overall this is about 3-1/2 feet long and about 15" tall. Tomorrow I will have another update on a project that you have seen a part of! Hi everybody! The last two weeks (since the release of the eCraftshop Pro software) has sucked up all of my crafting time. While I do enjoy tackling things head on and trying to figure things out, I miss creating. so today, I have a project to share with you. This was a super quick birthday card that I put together for a friend of mine! Happy Birthday Christina! First off, I used a card base created from PTI Raspberry Fizz cardstock, which you can't really see. I decided to do something different with this and instead a cutting down my card front to a 1/4" smaller on each side, I kept it the same size. This was a nice change of pace because that bright gorgeous pink was a unexpected surprise when you opened up the card. The card front was created with PTI Stampers Select White cardstock and I stamped it with the PTI Background Basics Tin Types using two different images, one in Ripe Avocado, and the next in Raspberry Fizz. 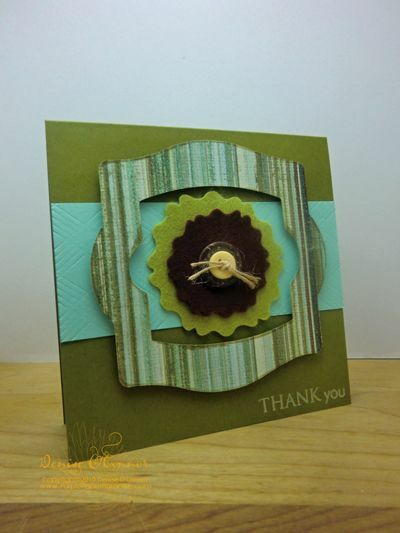 The label image in the front of the card was cut out on my eCraft using the software and PTI Spring Moss cardstock. Since the software doesn't bring SVGs in at their original size, I had to adjust the size a little bit trying to keep the proportions the same. I next stamped that piece with the third image from Tin Types in PTI Fresh Snow ink. The frame and the sentiment were from PTI Fillable Frames #1 and were stamped in Simply Chartreuse and Raspberry Fizz respectively. I used PTI Simply Chartreuse Swiss Dot ribbon to create the ruffled ribbon borders along with my trusty Scor-Tape (gotta love that tape!). All in all, this card only took about 15 minutes to create, and it totally suited Christina. While we are on UPDATE WATCH 2010....I will be posting various crafting projects. When the update comes out, I will again re-focus my attention on the software, and I will make a video of what we find in the software similar to the one that I made when the software was first released. Tomorrow, I will be showcasing a couple of updates to projects that you have seen pieces of before. Over the weekend, I got several e-mails and pleas for help in regards to the eCraftshop Pro software. Right now, I think everyone is in agreement that the software is not what we were hoping for. As I stated before the software was released, this software was not going to be great right off the bat. No software is. A lot of us, myself included have made lists for Craftwell on what we experienced with the software. We know that an update is coming, and so with that, we need to prepare ourselves for what we are likely to see in this update, and what we will not see. Clearly Craftwell's priorities are going to be in fixing the known issues that exist in the software as it is currently designed. Don't expect to see any major re-design in the software, but I will expect to see some of the features already in the software to be functioning better if not completely functional. For example, the shapes menu. There are 12 shapes available in this menu that do not cut correctly. I would expect that this is something that can be fixed in the first update. In fact, I believe that a lot of the problems that we are having with the software are due to a rendering issue that is also causing problems with SVG functionality. I believe that this is most likely Craftwell's priority and if they get this fixed, a lot of the problems we are having will be resolved. I hope that this underlying issue can be fixed with this first update, but be prepared that it may still be a bit sketchy. It will be even more important that all of us, report the issues we have after the update, because that will direct future updates. With this first update, I think it is important that we all understand that Craftwell will probably not be adding any additional features. Whenever you are working with software, it seems like the best course of action is to focus on fixing what is there before adding anything new to the mix. I have stated that I believe this program should have a split/breaking feature, but I don't expect this feature to happen in this update, and it may not happen in the next few updates. I will lobby for these enhancements, but for the time being we need to let Craftwell focus on fixing what is there. I look forward to the update with much anticipation. I stand by my original statement that the software has good bones. When the update comes out, we will see what Craftwell does to those bones. I would have to think that Craftwell is not going to give us an update that doesn't correct a fair amount of the issues, because that would severely hurt their reputation. Based on how well the eCraft is designed and manufactured, I would have to believe that they intend to give it their all in the software. Right now in the crafting community, users are viewing the eCraft machine and the eCraftshop Pro software as ONE product, and if they do not deliver a great end result on the software, it could hurt the success of the eCraft machine. That would be a big shame! I have so thoroughly enjoyed the machine, and I really want to be able to open up the horizons on this product. I plan on sticking with it through thick and thin, but I will always be honest and truthful on my opinions. So in exploring the eCraft's capabilities, I would be remiss if I did not cut up some glitter papers. 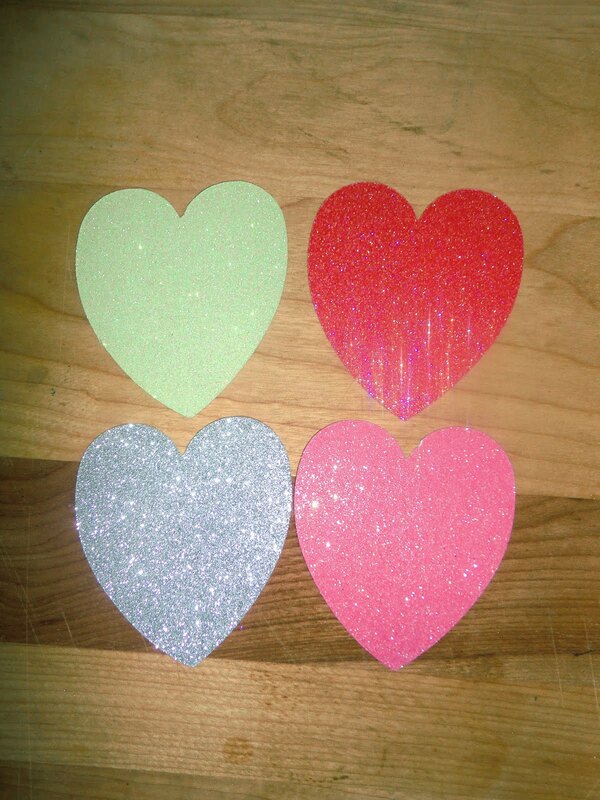 All of these glitter papers cut really well. They are all different thicknesses so the pressure settings vary. 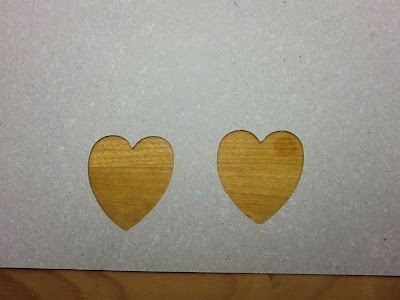 I did find that as long as you are not cutting intricate shapes, you will do better to cut these without tabs. I also found that it was better to cut all of these with the blade safety cap off. I think that the glitter cuts better with that extra bit of blade clearance. I tested out four different glitter papers. Next up, t-shirt vinyl (aka heat transfer vinyl). I don't know the brand name of this vinyl, I got this from http://www.craftvinyl.com/. I did a couple of test cuts and this one was a little tricky. The "backing" paper on this vinyl is actually a shiny piece of acrylic. Whenever I fed it into the machine, it would slide all over the place. I then determined that you need a cardstock stabilizer for it, but it would also slide all over the cardstock stabilizer. The thing that finally worked with this is to use some removeable adhesive and adhere it to the cardstock stabilizer before trying to cut it. 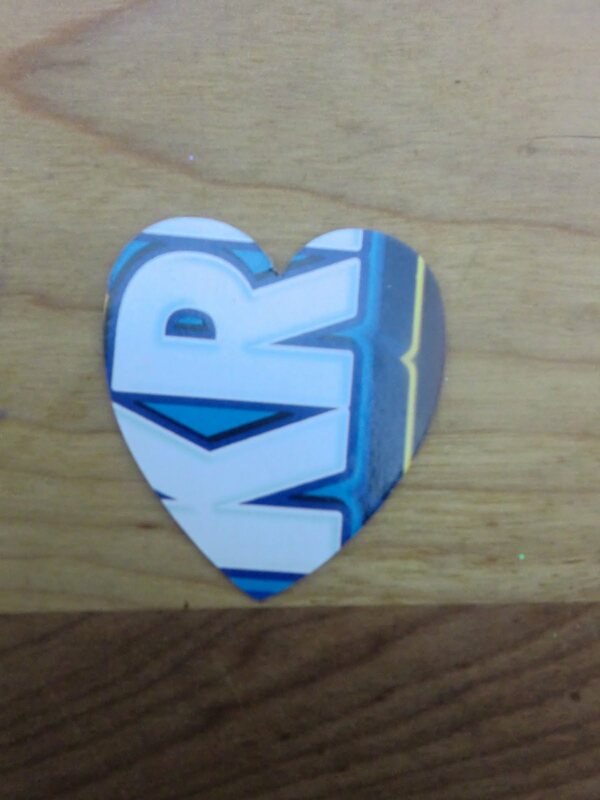 This vinyl is thicker than a traditional vinyl so therefore I needed to use a pressure of 6 to get a kiss cut on this vinyl. Of course I used no tabs on this. This vinyl does cut extremely well, and weeded without a problem. I absolutely love this product! I decided to go ahead and make a project to show you using t-shirt vinyl. I found this SVG in my stash, and imported it into eCP. First I cut it out of cardstock to make sure that this file would cut correctly, which it did. 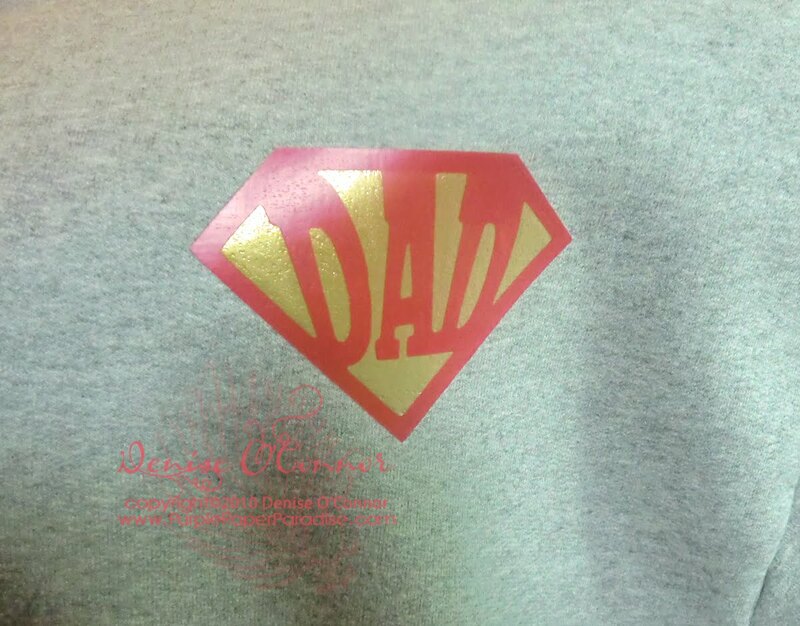 With t-shirt vinyl, you need to cut on the dull side and cut your image mirrored or flipped. eCP does have an option to flip an image, and so I tried it out and it worked fine. I cut both pieces, the background in gold, and the DAD in red. I then placed the gold background on a sweatshirt of my husband's and placed a teflon sheet on top of it, and then ironed away. This paticular t-shirt vinyl is a "cold peel" product which means that after you iron it, you need to let it cool down before peeling away the acrylic backing which acts like your transfer tape. I have found that it needs to cool for 3-5 minutes for best results. If the vinyl does not stick to your t-shirt, iron it again. Most likely this happens because your iron is not hot enough. Once I had the gold background in place, I layered the red DAD piece on top and then ironed that piece into place. Everything worked great, and I love how this looks. My friend Desiree and I plan on doing a bunch of t-shirts for our kids, we just need to put together our order and plan out what exactly we want to do. Hi everybody, I have an updated eCraft settings chart available. Please note that I made a few changes to the chart. I added a column for using the Cardstock Stabilizer method. There is also a column added to indicate if the Blade Safety Cap should be on or off. If anyone has any settings to add to this list, please email me at Denise@PurplePaperParadise.com so that I can add them in. To get the updated chart, click on the eCraft Setting Chart page or HERE. Thanks again everybody and enjoy! Well we know that the eCraft can cut felt because of the dresses that Suede from Project Runway designed and constructed, but how do we do it. Before the software was released, I started talking to Sara and she gave me the name of a product to try and she graciously sent me some pictures showing how she cut it. 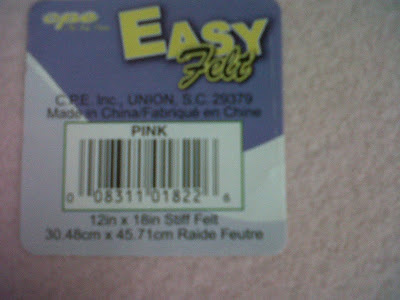 The product is called Easy Felt made by CPE. Here are the images that came courtesy of Sara from Craftwell. So now the search was on to find me some Easy Felt. I quickly found that this product was available at Hobby Lobby, so off I went. Easy Felt is extremely stiff! I was amazed at how stiff it is, and in all honesty, it is not really the type of product that I would like to use in my projects. 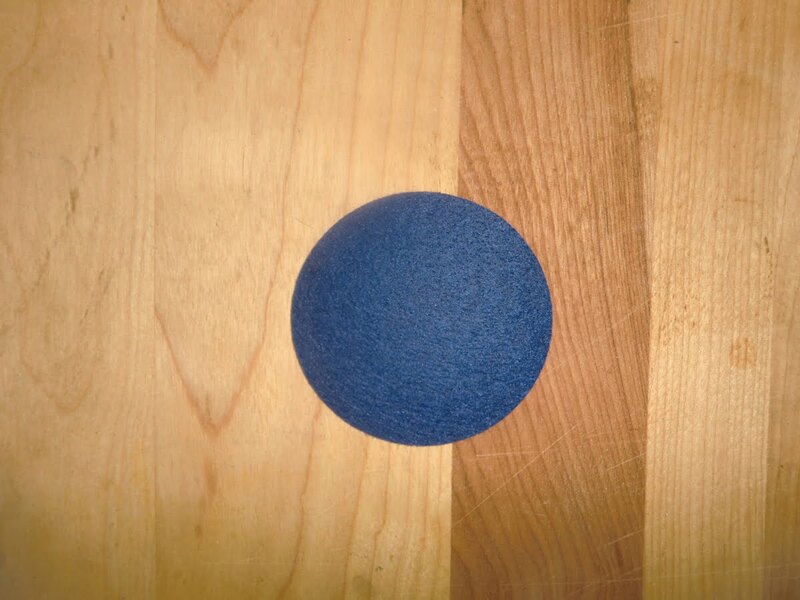 I would like the felt that I use to be more flexible and soft, but I decided to get a couple of pieces of it to see if I could get it to work. 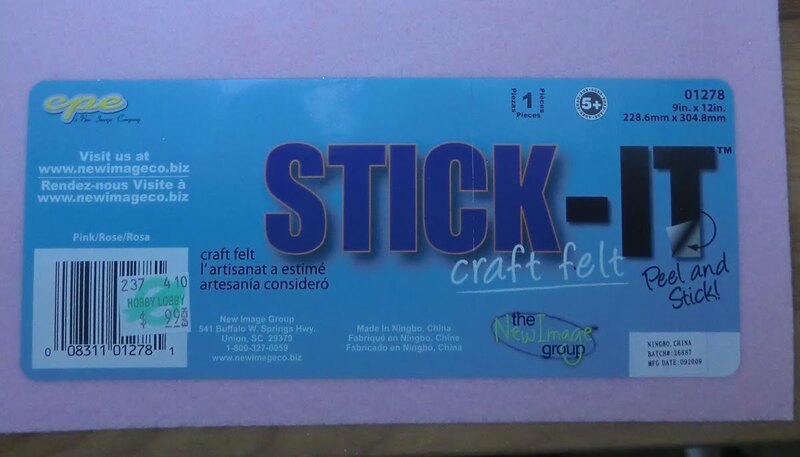 While I was at Hobby Lobby, I also saw a felt product made by CPE called Stick It. 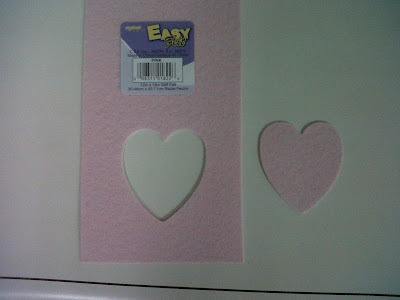 This is an adhesive backed felt and it is also quite stiff like the Easy Felt, so I decided to try that too. 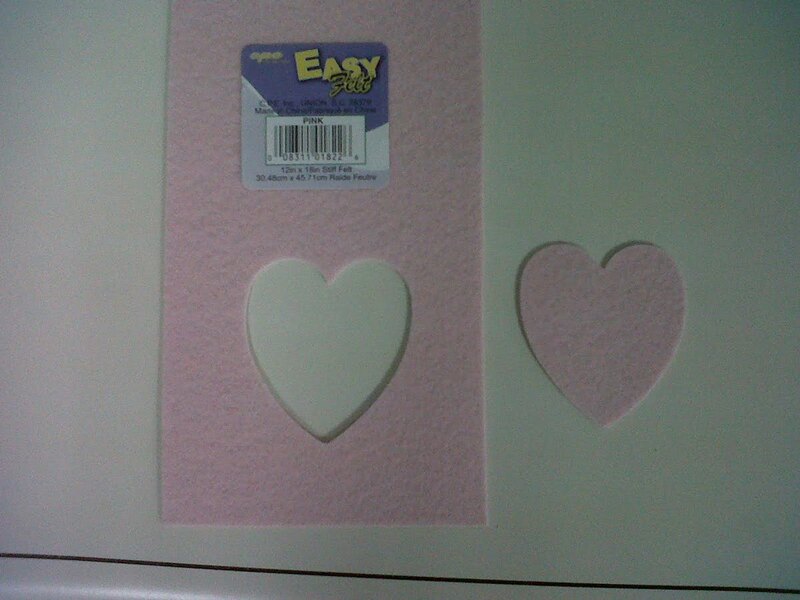 First I tried the Easy Felt. Sara indicated that she cut this at a pressure of 8, no tabs, and with the blade safety cap off. 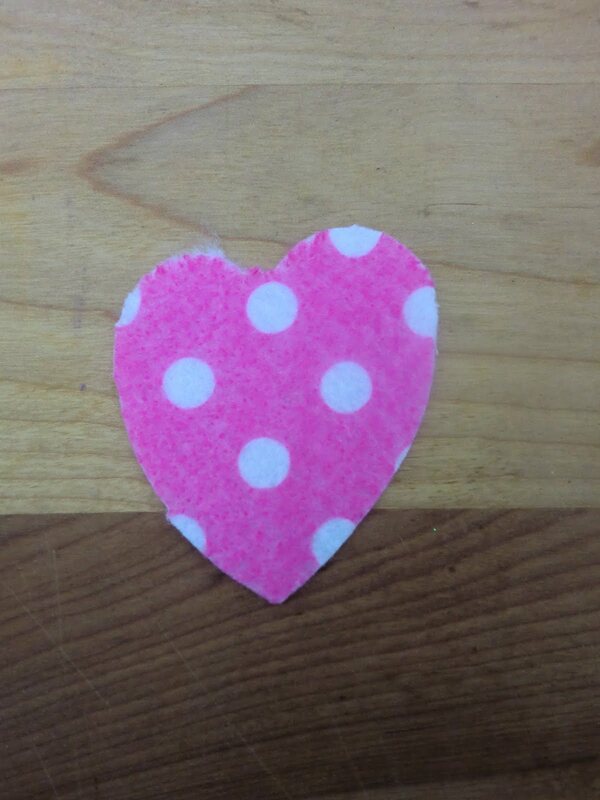 I decided to try the heart, because that is what she had successfully cut. Unfortunately I did not have the same luck with it. The blade got caught up in the felt and the felt got bunched up at the end. Here is what I was left with. I then tried it using the freezer paper method that I had successfully done with fabric, and got the same results. 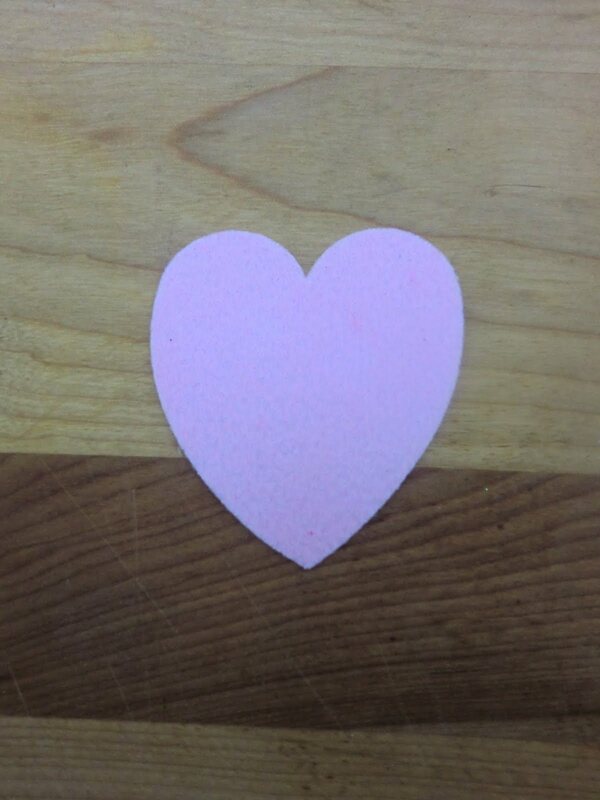 FYI I have tried the freezer paper method using a couple of other unstiffened felts without success as well. I decided then to see if I could cut a simple circle, and it worked! Clearly this is not what we are hoping for, so I need to do some more testing to see if I can figure something out. Next up the Stick It Felt. Using the same settings, this felt cut much better than the Easy Felt. It is an adhesive backed felt, which isn't really something that I have an interest in, but here are the results. I am going to play more with the felt, and I have sent off a message to the "felt expert" at Craftwell to see if I can get more information on cutting felt. 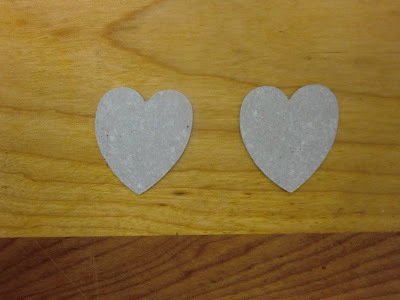 Ideally I would love to be able to cut Papertrey Ink felt, but not sure if that will be possible. I definately want to be able to cut a felt that I could then sew into, and I don't think I could that with either of these products. I will keep you all informed as to my progress on cutting felt. When Tom Meeks at the Create and Cut Blog posted THIS about taking the blade safety cap off, I knew we were really onto something. I decided to try this method on a couple of hard to cut products. First up, Grunge Paper! I had tried to cut Grunge Paper before this and was not very successful, but that all changed by taking the blade safety cap off. Not only could I cut it, but I could cut it in 1 pass. That's right, only 1 pass! Here are the results. EDIT: I used a pressure of 8 with no tabs on one cut, and tabs of 1 density and 1 width on the other. I would definitely use the no tabs in the future. I decided then to take on chipboard. I use a lot of cereal box chipboard in my projects, and would love to be able to continue to use it. It seems like there is a never ending supply of it in this house! Again I fed it in using a pressure of 8, no tabs, and blade safety cap off, and woila! It also cut in 1 pass! Yippee! Guess which cereal box this came from! Tomorrow I will have some more updates for you on products as well as an update on the eCraft Settings Chart, so be sure to stop by tomorrow! I am glad to say that I am within your first 50 followers. Have a ? for you. I have been planning on buying the MTC software but do you think I should hold off until you get through the eCraft demos? Which is easier for a beginner of the software and pc downloading and cutting? Here is my opinion at this point in time. As far as the eCraft machine goes, I really really like it. I have been able to cut things that I never would have even attempted on my Cricut Expression. When it comes to the software, it is not up to snuff...yet. The software has a good structure, but there are so many things that this software is either lacking or is not functioning the way it should. The software has only been with us for a little over a week right now, and I would guess that right now Craftwell is probably going through all of our e-mails and putting together a master list of things that need to be added and fixed. The next step for them will be to prioritize this list. We know that Craftwell has hired a software development company in India to write the program. So they will need to communicate with them what they want to be fixed first. My guess would be that the first issue would be to make the import of SVG files function better. I have had great luck with importing SVGs, but there are issues. One of these issues is that if you were to import an SVG where everything has not been set to a path, eCP does not have converting abilities to make these paths for you. There are some reports online of files where everything is set to a path, but it still is not cutting correctly, even on simple shapes. Now the big question is when will the software be updated to fix this problem? Since Craftwell has hired an outside firm to write the program, we and Craftwell are basically at their mercy. It could be a matter of maybe a few weeks or even longer. The next question we have to ask is, how long until the eCP software is what we want it to be? That is not so easy to answer, one possibility is that it will never be what we want it to be. I highly doubt that that will be the case, because Craftwell has shown that they are determined to make a great product and the software is what is going to make the eCraft a GREAT product. I hate to tell you this, but from the little experience I have in developing software, I believe that it could be several months before we get there. I would have to guess 6 months at least. Now that doesn't mean that 6 months will go by before we get an update. I suspect we will get updates along the way, but they are going to fix sections of the software one at a time. I could very well be wrong about this, only time will tell. It is not a secret that I love Make the Cut. I think that Andy (the developer), did an amazing job. I kind of wish that Craftwell just went to him and asked him to include the eCraft as one of the cutting machines that Make the Cut supports and then they could just offer each eCraft owner a copy of MTC. Make the Cut is not a perfect program, but it is the best out there that I have worked with. Andy is a big reason why the software is so great, he really listens to what we want. He is constantly updating the software and adding features to it. The MTC forum is outstanding, so many wonderful ladies and gents there that are willing to help. I have seen cases where someone goes on there and says I need this type of file, and someone will go and design it for them. How great is that? Andy and some of the others there also do webinars where they teach us how to use the software. They record these webinars so that they are available to watch at any time. I have been able to do everything that I have wanted to do and more with MTC. Another great thing about MTC is that there is a gallery available that users can post files that they have created online for others to download. There are thousands of files available with more being added every day. Since most likely the software is not going to be a good software for at least a few months, and Make the Cut right now is priced at $58.36, it is definitely something that I would consider doing. I purchased MTC about a month before I decided to pre-order the eCraft, and I have not regretted it at all. I should tell you that I am NOT an affiliate of Make the Cut. I do not make one red cent should you decide to buy it. I will only make recommendations of products that I personally love and cannot do without. Make the Cut is one of those products! If I were in your position, I might wait until after the first eCP update to see what gets accomplished in that update. I believe that the first update will give us an idea of how dedicated and determined the software development firm is. It will give us some big clues as to how long we might have to wait to get all the features that we want. If you want to get the feel of MTC, you can download a free trial version and see if it is something that you might like. One of the biggest features that MTC has is the ability to export your designs as an SVG file. Should eCP get the SVG issues resolved, you can always use MTC to do all your design work and just import those designs into eCP to cut with. This is what I anticipate that I will do until eCP is completely fixed. I have received a couple of comments here and on the eCraft_Crafters Yahoo Group, and I thought that I would address them here since they could be helpful to others as well. One reader (Kate Smith), mentioned that she is having trouble cutting some things in paper, but that they will cut in vinyl. I have had some great luck cutting some intricate things on the eCraft, even when cutting from the software. I have tried to cut a few things that I thought for sure would give me the stuttering problem, and they did not. The first thing that I would recommend to Kate to try is changing out the blade. When the eCrafts shipped, one blade was already installed in the trolley. For some reason, these first blades have been affected by shipping. I hope that Craftwell changes this for future machines so that no blade is installed. The next thing that I would recommend is to cut your image from a thinner piece of paper using the cardstock stabilizer. 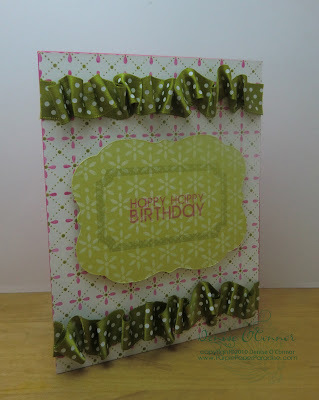 For more information on how to use this cardstock stabilizer, check out my post about it HERE. If you are still having problems Kate, let me know and we will figure it out! 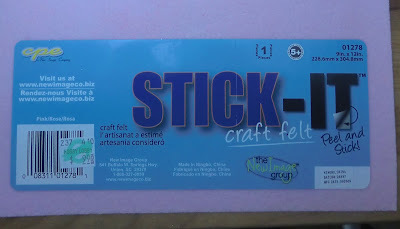 Linda from the Netherlands asked me if the cardstock stabilizer is just a regular piece of cardstock or if you needed to use a special piece of cardstock. I use just a regular piece of cardstock, similar to the Recollections cardstock from Michaels. I don't see why any piece that you have lying around won't work. Tom Meeks mentioned over at the eCraft_Crafters Yahoo Group that SVGs should probably be labeled as cuttable or not. The main reason why SVG files are not labeled as such is that most of the cutting softwares will convert a non-cuttable SVG into a cuttable file. For example, the file that was posted on the eCraft_Crafters Yahoo Group that was not set to a Path, imported just fine into Make The Cut. This is something that Craftwell should be fixing with eCraftshop Pro, and hopefully in the very first update. The other thing to keep in mind is MOST of the websites that crafters go to for SVG files are cuttable files. This information is really key for creating our own SVG files. Kay on the eCraft_Crafters Yahoo Group gave us a guide that she was using when SCAL 1 was released and this problem existed with that software. Here is the link to her GUIDE for you if you are interested. You may need to be a member of this group to access it. If you are not a member yet, WHAT ARE YOU WAITING FOR? This is a great group of people and a lot of really useful information, so don't hesitate! Even if you are just thinking about getting an eCraft, this is the place to find out alot about it! And there is one more thing that I forgot to mention in SVGs 101 post. If you have an SVG that won't import correctly into eCP and you have Make the Cut, you can try to import it into MTC to see if everything there shows up correctly. One of the great things about MTC is that you can EXPORT any file into an SVG file. That means that if that troublesome SVG imports OK into MTC, you can turn around and export it as another SVG file that should import into eCP better for you. If any of you have any other questions, please let me know. I am more than happy to help, and I love having an "excuse" to play with my eCraft. We are officially halfway there! At this point, we have 50 followers to this blog. Once we reach 100, I have a fabulous giveaway! Go to THIS post to sign up for the giveaway. P.S. I have a few added suprises that have been added to the giveaway, don't miss out! Earlier today, there was an SVG file posted on the eCraft Crafters Yahoo Group, and several people tried to cut it without success. When I started to see all of these posts, I decided to investigate, and I realized that some of the things that I know about SVG files, I took for granted that everyone already knew this! How silly of me to assume this? I apologize, because if I realized this earlier I would have posted all of this information earlier. I am going to reference a program called Inkscape in this post. Inkscape is a program that can be downloaded for free HERE and it is one of the programs that can be used to create SVG files. Here is the most important thing to understand...not all SVG files are the same! SVG stands for Scalable Vector Graphic, meaning that this is a file that when it is enlarged it will not pixelate. SVGs are very common in the graphic design industry for this very reason. You kind of need to think of an SVG file as a graphic file. When you compare an SVG to a JPG, a JPG will pixelate if you make the file too large. You can make a SVG into a JPG pretty easy, but it is not quite as easy to make a JPG into an SVG file. When we reference an SVG as a cutting file, we are ASSUMING that this SVG will cut, but we can't really make that assumption. Since an SVG is a graphic file, there could be several shapes and these shapes can overlap, which means that a die cutting machine, doesn't know what to cut unless we tell it what to cut. The way that we can tell the cutting machine what to cut is by putting those shapes on a PATH. Tom Meeks over at Create & Cut, kind of stumbled on this information earlier today and posted about it here on his blog. I am impressed that Tom figured this out so fast, as it took me quite a while to figure it out when I was trying to create my first SVG file! Great job Tom! I am going to elaborate a little on his post, so make sure you read his first. You can use Shapes to create your SVG files, you just have to make sure to set those shapes to a path before they can be cut. In the picture below, you will see that I drew an oval using the Circle, Ellipse Tool (located on the left hand side tool panel with the pink circle icon). For this example, I have chosen to have no fill, and a red stroke line. The stroke line is what we really need to be concerned with, so when you are creating an SVG, I recommend that you make sure to have a stroke color on to see where the die cutter is going to cut. The next thing that I am going to do, is select the oval by clicking on the mouse pointer icon located on the left hand side tool panel, and then clicking on my oval. When I do this, notice that there are now handles located on the bounding box on the oval. This indicates that the oval is now selected. Now I want to point your attention to the very bottom of the screen, under the color selection bar. When you have a shape selected, you will see this. Notice that is says Ellipse in layer Layer 1. This is what I am going to refer to as the information bar. This will let you know what is currently selected, and will also confirm to us when something has become a path. Next up, we are going to go to the Path menu on the menu bar. Shown here highlighted in yellow. From here, we are going to select the option titled Object to Path which is the very first option. You can also use the keyboard shortcut of Shift-Ctrl-C. Once we do that, when you go back to that information bar, we see this. We now have a cuttable SVG file. If you have downloaded a file from the internet, and you are having trouble cutting it, it could very well be that the objects, strokes, etc. are not on a path. Is there an easy way to tell if everything in the file is on a path...YES! Here is how you can tell. First off, here is a file that is similar to what you may see when you download SVG files. Now when we click on the image, we get a bounding box that surrounds all three scalloped ovals. And if we look in the information bar, we see this. A group, means simply that there are more than 1 shapes grouped together so that they can be selected as one. When we see this, there are two things that we can do, and I will show you each way. 1. Node Editor - On the left hand side toolbar, you will see an icon directly below the mouse pointer that looks like this. What this tool does is allow us to alter the nodes (or the points where our lines or curves meet). Nodes are only available with something is on a path, and this is what the software uses to measure out the information between points. When you click on this icon and then hover over a shape (even when it is in a group) you will see a red outline. When you click on the shape you will see this. Each one of those gray boxes are a node. When you see this, you know that your SVG is on a path, and that this is a cuttable file. I will explain more about node editing on another post because this is a very powerful tool for us crafters to have in our arsenal, and it is essential to create your own SVGs using Inkscape. 2. Ungroup the Group - This is going to be crucial with this paticular SVG (especially cutting in eCraftshop Pro since it does not have a Break or Split feature). Right now if we were to import this file into eCP, all three scalloped ovals will import in, and all three would have to cut. What if you only want to cut one of these ovals, which is the case 99% of the time? Since I have these ovals grouped, the first thing we would need to do is ungroup them. To do this, make sure you have your selection tool on (the mouse pointer icon on the left hand side toolbar) and have the group selected so that you see Group in the information bar. Now go to your menu bar and select the Object menu and from that menu, select Ungroup. Now we will see this. Notice that all three shapes now have seperate bounding boxes. And when we look at the information bar, we will see this. This is letting us know that we now have 3 objects that are Paths selected. You now know that all three shapes are cuttable. Now just because we ungrouped these shapes, does not mean that we can import them into eCP as seperate shapes that can be manipulated in eCP. Since all three shapes are in the same SVG file, all three will still import. What we now have to do is take each shape and save it into a seperate SVG file. 1. Select your shape using the selection tool (mouse pointer on left hand side tool bar). Look in the information bar and make sure that it is a Path. 2. Go to the Edit menu on the menu bar and from the Edit menu select the Copy command. 3. Go to File menu on the menu bar and select New followed by Default. 4. In the new file, go to the Edit menu on the menu bar and select Paste in Place or Paste. 5. Go to the File menu and select Save As. Select where you want to save the file on your computer and give it a name. 6. Repeat these steps for any additional shapes in the file. I am NOT an Inkscape expert. Inkscape is an amazingly complex program even though it is free. I have watched numerous tutorials online to learn what I know, so I may not always use the correct terminology. I try to use language that is easily understood by the masses. I must tell you that there is one webinar that I watched a couple of months ago that was incredibly helpful. This webinar is from Bryan over at the Make the Cut forum. HERE is a link to the post where you can find it (dated 6/9/10 in 2 parts). You may need to sign up as a user on the MTC forum to be allowed to download the webinar. You do not need to own MTC to sign up for the forum. This webinar (if memory serves) is a couple of hours long, but was increadibly helpful, especially with the Bezier tool, which I will cover in a later post. If you can find the time to watch this webinar, I highly recommend it. If you have gone through these steps and determined that you have a cuttable SVG file, please make sure that you are going through these start up steps. Since I have started to do this, I have not had trouble cutting SVG files, unless they are too small. If you want to know why these steps are important, please check out THIS post. If you are still with me, thanks! If you have found this helpful, and would like to learn more, or if you have a certain topic in mind, please leave me a comment and I will be sure to address it in a future post. As you all know, I have been doing some testing on the eCraftshop Pro software. A few days ago, I posted that I was having an issue with cutting two files back to back. Well that problem appears to have been solved, and now I think I may be onto something else. I need all of you eCraft owners to help me test this theory out. First off, something that I have not experienced before with my Cricut. When I was having the problem with cutting back to back SVG images, I mentioned it to my hubby. He is a computer junkie, and started messing around with my laptop, and sat there with me while I tested out some things, and he made a discovery. The driver for eCraftshop Pro does not load properly if you turn on the eCraft AFTER the software is up and running. So what we started to do was this....1) Plug in the eCraft to the computer. 2) Turn on the eCraft. 3) Start the eCraftshop Pro software. When doing this we had no problem making multiple cuts using SVGs that were created in Illustrator, Inkscape, and Make the Cut. Here is where things get tricky again, I cut a ballerina SVG without a problem. I don't know where I got this file from, so I cannot share it, but I will show you a picture of it, so you have an idea of what I am talking about. This ballerina cut fine. I then decided to cut the ballerina smaller, and resized it to this, and that is when I had the stuttering and dying problem. When looking at this file, you may wonder why it is having problems cutting it. When you look closely at the file, the fingers of the ballerina are very close together, and I think that may be where the problem is. I went back to some of the other SVGs that I had trouble cutting and made them cut larger and they cut without a problem. When I made them smaller, again the same problem. I am now wondering if there is some sort of setting in the program, that prohibits the machine from cutting images that have such close cutting lines. I also took one of these images, and set it to be a draw line instead of a cut line and that made no difference. My hubby believes that this is something in the program as well. 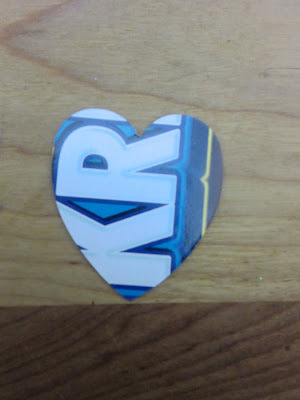 I mentioned to him that if I did this on my Cricut, it would cut, but the end product would probably be mangled. He said that a cutting machine is basically a printer with a blade, and so there has to be something in the software that is stalling the machine. If you think about this, it kinds of makes sense that this is new to us. Since the SD cards are programmed so that it will not cut an image smaller than pre-programmed sizes, we wouldn't know how the machine would react if the lines of an image are too close together. So I am calling all eCraft owners to test this out for yourself. I am going to try to duplicate this with an SVG from a known source so that I can direct everyone to try with the same file. Please share your results! So there have been some reports that SVGs imported into eCraftshop Pro do not cut right, so after doing some thinking, I decided that there are only a couple of factors that could be the cause of the problem. 1. The driver. Since everyone is using the same driver, there is no way for us as users to test the driver directly. As far as I know, testing will have to be done by Craftwell on the driver. 2. The source. Since SVGs can be created with a few programs, could there be something in one or more of these programs that is causing the cutting problems. At this point, I cannot think of what else could be contributing to this, so I decided to do some testing on the source of the SVGs. I went through my SVGs and selected a couple that were created in Inkscape, a couple that were created in Illustrator, and a couple that were created in Make the Cut. I went ahead and started to cut these files, and I noticed a trend. I would appreciate it if others could test this out to see if they came up with the same problem. First I opened a file posted by Ruthie on the eCraft_Crafters Yahoo Group, that was created in Inkscape, and that she reported cut fine. I cut that out without a problem, I then opened up a second file that was created in Inkscape and that one stuttered out and died pretty quick. I had to reset the machine, and then I tested out the Illustrator files. The first one, cut out part of the image. It did not stutter out, it just stopped cutting like the file was done. I am going to try to cut this one on the Cricut, but I suspect that there is some sort of issue with that particular SVG. I then opened up another Illiustrator file, and it stuttered and died after cutting out a small portion of the file. I had to reset the machine and then start up again. I opened up the first file created in MTC, and it cut great. The second file, stuttered and died. This seems like more than a coincidence, why is it that the 2nd file is the one that stutters out? I then got curious. I cut out an SVG, and then tried to cut something manually with the SD card, and guess what? It stuttered and died. I am not a computer genius by any stretch of the imagination, but it sure seems like this is a driver issue. If there is anyone else out there that could test this out, I would like to know if this is limited to my machine/computer combo, or if this is more of a blanket result. I know that people have reported the stuttering and dying problem, but I would be interested to know if this is happening to some people on every cut. I am going to do some more testing with this to see if these results are consistent with me, but I would like to hear from others to see if we are on a track to finding a solution. In various places online, there has been a lot of bashing going on in regards to the eCraftshop Pro software. I understand why people feel like this, after all the software needs a lot of work. I would love to be able to rave about the software, but I definitely can't do that. I am someone that always tries to look at the positive rather than the negative. When my mind gets clouded with negative thoughts, I am less productive and in general I just don't like the way it makes me feel. So I am someone that tries to find the silver lining. So what is the silver lining here? First off, the more I become familiar with the machine, the more I like the machine. 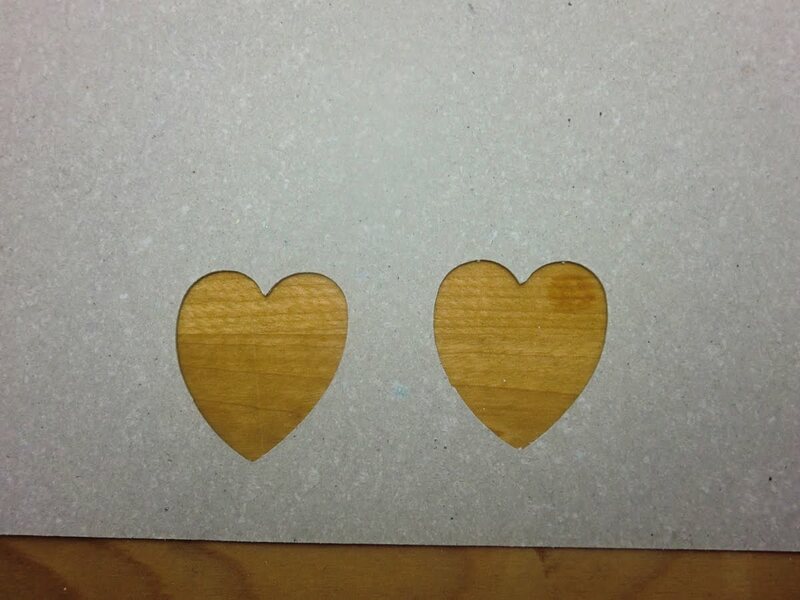 I was able to cut some things that I thought I might not be able to with the eCraft, and they cut beautifully. I LOVE not having to use a sticky (waste of money) mat. I am so happy that I am finally able to cut perfect circles! I can't tell you how much that always annoyed me with my Cricut! Now, the major issue that needs to be addressed is the software. The most important thing to keep in mind is that the software can be changed, whereas the machine could not. So, I feel like we are on the right track. Craftwell clearly put a lot of time, effort, and money into the machine, and maybe not as much into the software. We now have the opportunity to help Craftwell develop this software into something that we WANT to work with! How great is that? We actually can help them create a great software product to go along with a great machine. As I was working on this post and trying to figure out how to put all my thoughts down in words, I found THIS post by Tom at Create & Cut, and I think that he really sums it up beautifully, so I urge you to read this. I have not told all of you about my professional background before, but I feel like now is the time. My father in law owns a heating and air conditioning company, and several years ago, he had a vision. In the heating and air conditioning business, we work a lot on gas forced furnaces. In a furnace, there is a part called the heat exchanger. The sole purpose of the heat exchanger is to hold all the combustion gases that the furnaces creates and then get them out of the house. The key thing that it must do is keep these gases out of your home. These gases can be deadly, and most people are familiar with carbon monoxide as one of the most deadly. In the United States, roughly 200 people die every year from carbon monoxide poisoning caused by furnace heat exchanger failure. The problem with this heat exchanger is that it is extremely large, and nearly impossible for a technician to inspect for failure, including holes, cracks, rusting through, etc. 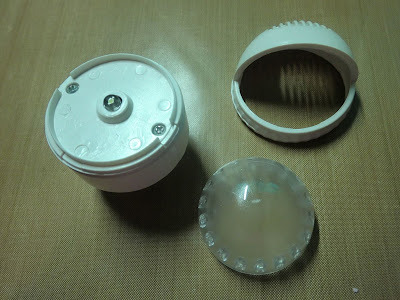 At the time, the way technicians were inspecting it was with a mirror (similar in style to the mirror a dentist uses, and maybe about 3-4" in diameter) and a flashlight. Using this method, technicians can really only see about 20% of the heat exchanger. On top of that, if a technician found failure, because of the angles, it was nearly impossible to be able to show the homeowner what he was seeing. My father in law wanted to develop a better way to inspect the heat exchanger and at the same time, show it to the homeowner so that they did not have to take the technician's word for it. He developed a camera system called the Inspector. This is truly a great product, and my father in law has sold them all over the US and Canada. About 5 years ago, he added a feature to the camera that we call the DVR (Digital Video Recorder). This allows the technician to record the inspections. When my father in law did this, my husband and I realized that we would need to have software that could process these inspections and make DVDs. With some coaxing we convinced my father in law to let us work on this to make the camera even better. Working with a major software manufacturer, we developed software that would do that, as well as create discs that could be used for training purposes. My father in law holds classes now about 6 times a year where technicians can come and get trained on how to use the camera, how to record inspections, and also how to communicate what they finding to homeowners. I also teach classes on how to use the software. Although, we did not develop the software on our own, I am a little familiar with the process. I know that it can take some time to get everything just right. I also know that not everyone is going to be happy. I have clients that want to put minimal effort into it, and then are disappointed in the results. Software cannot read our minds, and the more we put into it, the more we get out of it. So with that in mind, we can now use this opportunity to help Craftwell develop a great product by reporting the facts, our NEEDS and our WANTS. We can be patient as we allow them to develop the things we NEED first, and then work on the things that we WANT. Sorry for such a long story, but with that being said. Let's focus on what can be changed, and help Craftwell do that, because I think in the long run, it will be rewarding for all of us. Also, I have made some progress on cutting some various materials with the eCraft, and will post some more findings either later tonight or first thing tomorrow morning. This afternoon I am going to do some various test cutting using the software and see what I can find out that may help Craftwell. Keep a lookout for my findings, and if you discover anything, please let all of know! The more people that can test out problems, the more we can help solve the problem! The software is here, and after going through a cumbersome installation process, I have had a chance to play with it a little bit. I will be working more with it here in the next few days. As expected, this software is not great. I would love to be able to tell you that it is, but there are some significant things that need to be fixed. I will be constructing a list of the issues that I have with it, to give to Craftwell. In the past, Craftwell has been very receptive to users and their thoughts on the types of things that the eCraft should be able to do, so I anticipate that they will have the same attitude towards the software. If they do not respond and make the software something that crafters will want to use, that could spell big trouble for the eCraft. Consumers may be reluctant to purchase the machine and/or third party software developers will come into play and make software that crafters will want to use. It is really in Craftwell's best interest to address these software issues as quickly as possible. I do have to say one more thing about the software...it has good bones. It has been developed to be user-friendly and easy to understand, which is always a plus. With updates, this software can be updated to become a more advanced software program. For a first version of a software, it isn't horrible (it could be a lot worse) and no one should take this to mean that this will be the final product. They have a decent platform here upon which to build, and those of us that use it should be offering our critiques, in the spirit of building something better. Here are the videos, showing just a quick overview, in two parts. The software is now available. I have downloaded and installed it. I will work with it tonight and try to get a video up for everybody. eCraftshop Pro Software...Where are You? Ok, so yesterday, I spent the entire day getting caught up on things here at home, so that today I could play with the software as much as possible. It is now 3:00PM (CST) and no software yet. I have been like a crazed person checking my e-mail, trying to be patient, and not succeeding. I was hoping to get a video of the software on here for everyone today, but now I am starting to wonder if the software is going to make it today. The day isn't over, so I will try to be patient. If the software does become available, I will try to get a video up here for you before the end of the day. I have a very busy day tomorrow, so I really hope it comes soon. I will keep you all posted as I know more. I am on the Craftwell Design Team! Visit the Design Team Blog! Learn more about the eCraft & eBosser!